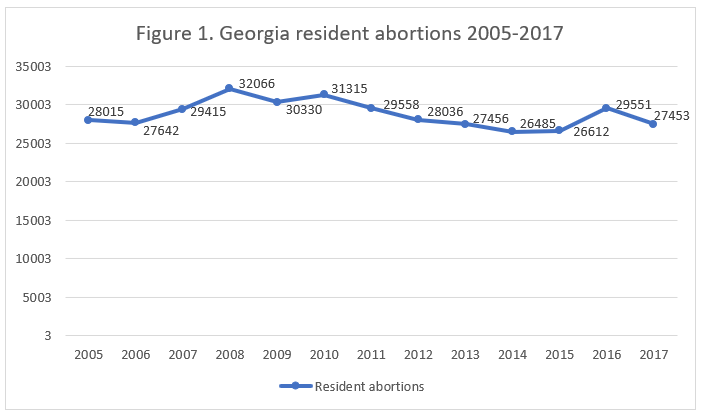 Georgia’s abortion statistics for 2017 reveal that reported abortions in the state have declined after an increase in 2016. Rather than publishing an abortion report, the state makes abortion data available in an online portal hosted by the Georgia Department of Public Health. *Information is for resident abortions only. Information on chemical abortions in Georgia and Planned Parenthood’s Georgia market share is not publicly available. Because Georgia uses a different method to calculate its abortion rate than other states do, the abortion rate is not displayed here. In 2017, there were 27,453 abortions performed on state residents in Georgia (Fig. 1). Georgia reports abortions performed on resident women only, rather than all abortions occurring in the state. Reported resident abortions have fallen by seven percent from the 29,551 reported in 2016 and by 18 percent from 1994, the first year of data available online. Georgia reports the state abortion rate but uses a different denominator than most other states, calculating the rate as the number of abortions per 1,000 women ages 10-55. In contrast, most states calculate the rate as the number of abortions per 1,000 women ages 15-44. To allow for easier comparison between states, CLI estimated Georgia’s abortion rate using the more common formula (Fig. 2). Over half of the abortions (58 percent) were performed on resident women in their twenties. Thirty percent were in their thirties, eight percent were age 19 or younger, and four percent were age 40 or older. Ninety-three percent of the women lived in nonrural counties, while just seven percent of the women lived in rural counties. Black women underwent a sizeable majority of the abortions performed on resident women, accounting for a whopping 61 percent of reported abortions while making up only 37 percent of Georgia’s population of women between the ages of 15 and 44. Twenty-three percent of the abortions were performed on white women, four percent on Asian women, and 0.2 percent each on American Indian/Alaska Native and Pacific Islander women. One percent of the abortions were performed on multiracial women. However, 11 percent of the abortions were performed on women of unknown race. CLI estimates that the abortion rate among white women was 5.1 abortions per 1,000 white women of childbearing age, less than a quarter of the abortion rate among black women of 20.8 abortions per 1,000 black women of childbearing age. Recently, Georgia has taken fresh steps to protect life. The state currently protects unborn children who are capable of feeling pain by limiting abortion after 20 weeks and could soon expand those protections further. The state legislature has passed a bill that would protect unborn children as soon as a heartbeat is detected, joining multiple other states that are working to protect unborn children at this point in pregnancy. Georgia Governor Brian Kemp has indicated his support for the legislation. However, because Georgia does not report abortions by gestational age and does not report all abortions performed in the state, it is not clear how many unborn children would be protected by this bill. In a 2016 CLI study that evaluated abortion reporting across the nation, Georgia’s reports were tied for 25th best. Georgia could improve its reporting by including all abortions occurring in the state, not just those performed on state residents. Additionally, Georgia could report abortions by gestational age and add information on the types of abortion procedures used and the marital status, level of education, and pregnancy history of women who get abortions – information it currently collects but does not report. 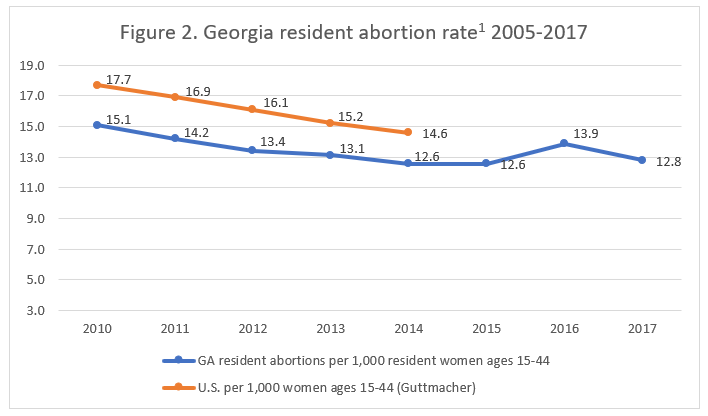 As Georgia seeks to pass laws impacting abortion, detailed, accurate abortion statistics are increasingly relevant. Georgia calculates the state abortion rate using a different formula than most other states. To allow for comparison between states, rates were calculated by the Charlotte Lozier Institute using population estimates from the United States Census Bureau. The rates were calculated using the following formula: (total number of abortions performed on resident women in Georgia ÷ number of resident women ages 15-44) x 1,000.